Fortunately, you don’t just have to sit there while your skin takes a beating! 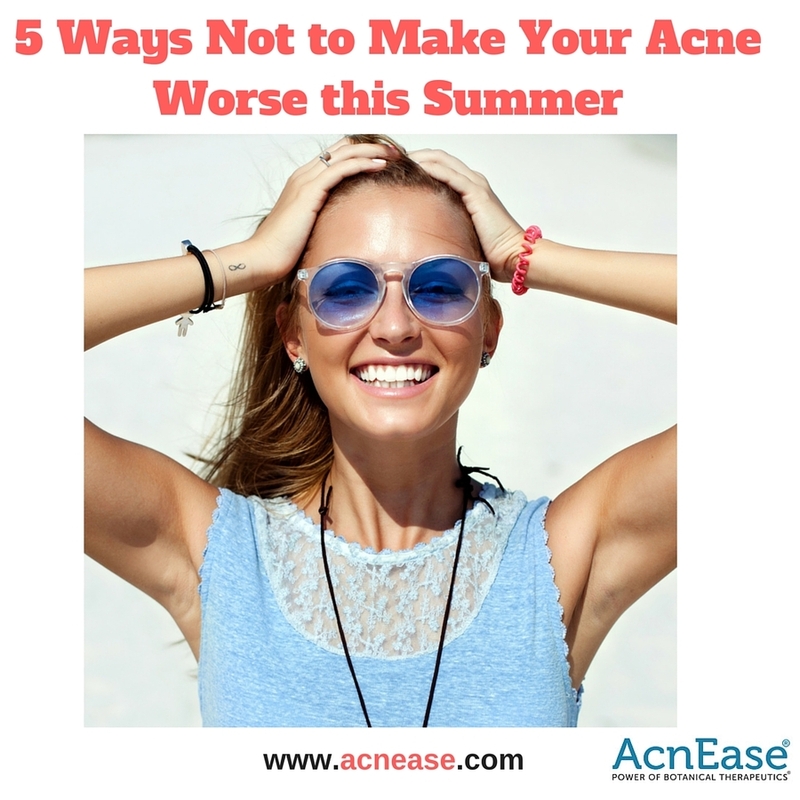 There are several simple measures anyone can take to assure that you are not making your acne condition worse this summer. Not only have we made it easy for you to choose the proper acne treatment for you, but here are a few of our favorite tips to assist you along the way. Seek shade, not direct sun. It’s not uncommon knowledge at this point - the sun can do some serious damage to your skin. The myth that the sun is a good way to treat acne has been debunked for some time now, and it's important to take this suggestion seriously! The UV rays of the sun are actually pro-inflammatory, meaning any existing pimples can become irritated with too much exposure. Not only that, sunlight can also darken existing acne scars or pigmentation. Once that bronze tan fades, you might be left with a lot of dark marks, which won’t be easy to reduce.If you can’t find a shady porch, tree or beach umbrella outside, try keeping a hat in your bag, and a light sarong or scarf to drape over the neck, chest, back and shoulders. As always, do not skip the non-comedogenic (mostly zinc) sunscreen! It’s so important to rinse off any type of water you’ve been swimming in – from chlorine, to salt water.While some oily-skinned people might notice a decrease in acne symptoms after a few dips in the pool, the bacteria-fighting properties of chlorine can actually do more harm than good in the long run. Chlorine has a tendency to dry the skin out beyond what is healthy, even if you do have a super oily complexion. If you find yourself poolside this summer and notice a tight feeling on your face, be sure to rinse away that chlorine with fresh water, and follow up with a gentle soap-free cleanser, and non-comedogenic moisturizer if possible. Salt water (or any outdoor water source) from the ocean also needs to be washed away…it can do similar damage. Whatever you use on your skin (topically) to clean, maintain, beautify or anti-age during the summer, opt for lighter formulas.It doesn’t matter if we’re talking makeup, sunscreen, moisturizer, or face wash, summer weather calls for lighter formulas all around. If you can’t bear the thought of stepping out bare faced, you can make minor adjustments, like switching up the heavy foundation for a lighter BB or CC cream, or tinted oil-free moisturizer. The heat has our skin producing more sweat in the summer months in an effort to cool the body down, and the sebum our skin needs to stay hydrated travels along those same follicles, so we definitely don’t want to clog those pores with a heavy, sticky formula. Moisturizer and sunscreen labeled “oil-free” or “lightweight” typically works best for all skin types this time of year, and still works to deliver a healthy heap of hydration. Summer is synonymous with dewy, glowy skin, so to avoid a meltdown, keep the formulas light - your skin will thank you for it! Don't forget your acne treatment! At home, on a cruise, traveling or visiting Grandma,don’t skip your systemic treatment. Quick summer hacks are a tempting solution for those with problem skin, but for lasting results, proper skin care is an inside job. When it comes to truly treating acne, meaning, getting rid of existing breakouts while preventing new ones from coming up, an acne treatment is needed. Making adjustments to your skincare routine for summer can truly go a long way in saving the state of your skin, but it will only take you so far. Why? Acne is a usually the result of a hormonal imbalance. This imbalance then makes your sebaceous glands, which control oil production, to go haywire, so if they produce too much oil, here comes acne. Our AcnEase® users are able to experience how a treatment can act as a buffer between the hormones and sebaceous glands so that sebum production can return to normal. When combining the AcnEase treatment that’s right for you with the healthy skincare habits, you can rest assured in knowing that your skin is getting its best chance at remaining healthy and acne-free. What are some of your must-do moves for keeping your skin acne free in the summertime? Tell us in the comments!